Plan ahead and book 4 days in advance to save up to 15% on your room rate when adding lift passes. Lift tickets are Tri-Area passes valid at either Sunshine Village, Mt. Norquay, or Lake Louise Ski Resorts. All tickets include ski bus shuttle, free night skiing at Mt. Norquay (when available) and free tubing at Mt. Norquay (when available). 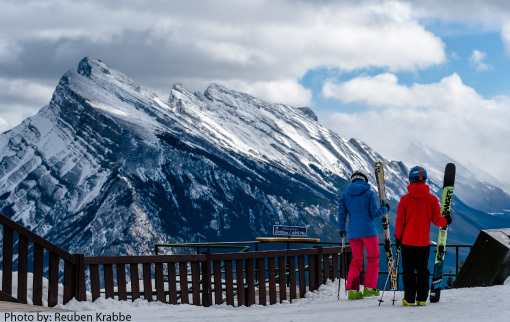 When skiing for 3 days or more you will also receive Banff Upper Hot Springs Passes, Whyte Museum Passes, 2 for 1 LUX Cinema tickets and 2 for 1 Ultimate Ski Rental voucher. Discount applies to our best available room rates and is only applicable when purchasing accommodation and lift tickets together through our Reservations Department. Requires a minimum of half the adults staying in the room skiing at least half of the length of stay. Changes to travel dates, number of guests and number of ski days may result in a change to your rates. Cancellation of ski lift tickets within 7 days of arrival are non-refundable. Full package price is non refundable within 72 hours of arrival date.